A-HOTEL.com - Luxury and cheap accommodation in Krekshino, Russia. Prices and hotel, apartment booking in Krekshino and surrounding. Guest house Berloga is set in Solmanovo. The property features a bar, as well as a restaurant serving Russian cuisine. Located in Lesnoy Gorodok, Дом с бассейном и баней offers accommodation with a private pool and garden views. It provides free WiFi and barbecue facilities. 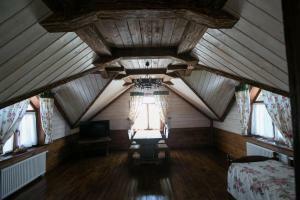 Featuring free WiFi, Motel Lesnoy offers accommodation 6 km from Odintsovo. Moscow is 14 km away. Lesnoy Country House in Odintsovo features a garden and a terrace. With free WiFi, this 4-star hotel offers a 24-hour front desk. Featuring free WiFi, a restaurant and BBQ facilities, Congress center of tourism and leisure Golitsyno offers accommodation in Golitsyno, 13 km from Patriot Congress and Exhibition Centre. There is a restaurant and guests can have fun at the games room.